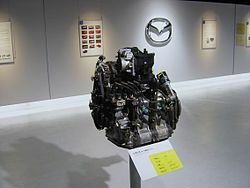 All Mazda Wankel engines (a type of rotary combustion engine) are essentially a single family — they all derive from experiments in the early 1960s by Felix Wankel, a German engineer. Over the years, displacement has been increased somewhat and turbocharging has been added to great effect. Wankel engines can be classified by their geometric size in terms of radius (rotor center to tip distance, also the median stator radius) and depth (rotor thickness), and offset (crank throw, excentricity, also 1/4 the difference between stator's major and minor axes). These metrics function similarly to the bore and stroke measurements of a piston engine. Displacement is 3√3radius·offset·depth, multiplied with the number of rotors. Nearly all Mazda production Wankel engines share a single rotor radius, 105 mm (4.1 in), with a 15 mm (0.6 in) crankshaft offset. The only engine to diverge from this formula was the rare 13A, which used a 120 mm (4.7 in) rotor radius and 17.5 mm (0.7 in) crankshaft offset. Mazda rotary engines have a reputation for being relatively small and powerful at the expense of poor fuel efficiency. They are starting to become popular with kit car builders, hot rodders and in light aircraft because of their light weight, compact size, and tuning potential stemming from their inherently high power to weight ratio . In auto racing, the displacement of a Wankel engine is usually doubled for classing purposes. For calculating taxes in Japan, the displacement of Wankel engines is defined as the equivalent of 1.5 times the nominal displacement, so the 1300 cc 13B engines are taxed as 1950 cc. Mazda's first prototype Wankel was the 40A, a single-rotor engine very much like the NSU KKM400. Although never produced in volume, the 40A was a valuable testbed for Mazda engineers, and quickly demonstrated two serious challenges to the feasibility of the design: "chatter marks" in the housing, and heavy oil consumption. The chatter marks, nicknamed "devil's fingernails", were caused by the tip-seal vibrating at its natural frequency. The oil consumption problem was addressed with heat-resistant rubber oil seals at the sides of the rotors. This early engine had a rotor radius of 90 mm (3.5 in), an offset of 14 mm (0.6 in), and a depth of 59 mm (2.3 in). The very first Mazda Cosmo prototype used a 798 cc L8A two-rotor Wankel. The engine and car were both shown at the 1963 Tokyo Motor Show. Hollow cast iron apex seals reduced vibration by changing their resonance frequency and thus eliminated chatter marks. It used dry-sump lubrication. Rotor radius was up from the 40A to 98 mm (3.9 in), but depth dropped to 56 mm (2.2 in). One-, three-, and four-rotor derivatives of the L8A were also created for experimentation. The 10A series was Mazda's first production Wankel, appearing in 1965. It was a two-rotor design, with each displacing 491 cc for a total of 982 cc. These engine featured the mainstream rotor dimensions with a 60 mm (2.4 in) depth. The rotor housing was made of sand-cast aluminum plated with chrome, while the aluminum sides were sprayed with molten carbon steel for strength. Cast iron was used for the rotors themselves, and their eccentric shafts were of expensive chrome-molybdenum steel. The addition of aluminum/carbon apex seals addressed the chatter mark problem. The first 10A engine was the 0810, used in the Series I Cosmo from May, 1965 through July, 1968. These cars, and their revolutionary engine, were often called L10A models. Gross output was 110 hp (82 kW) at 7000 rpm and 130 Nm (96 ft·lbf) at 3500 rpm, but both numbers were probably optimistic. The 10A featured twin side intake ports per rotor, each fed by a one of four carburetor barrels. Only one port per rotor was used under low loads for added fuel economy. A single peripheral exhaust port routed hot gas through the coolest parts of the housing, and engine coolant flowed axially rather than the radial flow used by NSU. A bit of oil was mixed with the intake charge for lubrication. The improved 0813 engine appeared in July, 1968 in the Series II/L10B Cosmo. Its construction was very similar to the 0810, but the ports and carburetion were revised to produce 130 hp (96 kW) at 7000 rpm and 140 Nm (103 ft·lbf) at 5000 rpm. Again, these were Japanese net output figures. The 10A was substantially revised for wide-scale production in the R100/Familia Rotary. Many changes were made in an effort to reduce production costs. These included the use of cast iron in the housing sides, less-expensive molded (instead of sand-cast) aluminum for the housings, and chrome-steel for the eccentric shafts. The port arrangement remained the same, but exhaust was no longer routed around the housing. Japanese-spec gross output was 100 hp (75 kW) at 7000 rpm and 133 Nm (98 ft·lbf) at 3500 rpm. The use of less-expensive components raised the weight of the engine from 102 kg (224 lb) to 122 kg (268 lb). The final member of the 10A family was the 1971 0866. This variant featured a cast-iron thermal reactor to reduce exhaust emissions and re-tuned exhaust ports. The die-cast rotor housing was now coated with a new process: The new Transplant Coating Process (TCP) featured sprayed-on steel which is then coated with chrome. Gross output was 105 hp (78 kW) at 7000 rpm and 135 Nm (99.5 ft·lbf) at 3500 rpm. The 13A was designed especially for front wheel drive applications. It had two 655 cc rotors for a total of 1310 cc. This was the only production Mazda Wankel with different rotor dimensions: Radius was 120 mm (4.7 in) and offset was 17.5 mm (0.7 in), but depth remained the same as the 10A at 60 mm (2.4 in). Another major difference from the previous engines was the integrated water-cooled oil cooler. The 13A was used only in the 1969–1972 R130 Luce, where it produced 126 hp (94 kW) and 172 Nm (126 ft·lbf). This was the end of the line for this engine design: the next Luce was rear wheel drive and Mazda never again made a front wheel drive rotary vehicle. The 12A was a "bored-out" version of the 10A — the rotor radius was the same, but the depth was increased by 10 mm (0.4 in) to 70 mm (2.8 in). Each of its two rotors displaced 573 cc for a total of 1146 cc. The 12A series was produced for 15 years, from May 1970 through 1985. In 1974, a 12A became the first engine built outside of western Europe or the U.S to finish the 24 hours of Le Mans . In 1974, a new process was used to harden the rotor housing. The Sheet-metal Insert Process (SIP) used a sheet of steel much like a conventional piston engine cylinder liner with a chrome plated surface. The side housing coating was also changed to eliminate the troublesome sprayed metal. The new "REST" process created such a strong housing, the old carbon seals could be abandoned in favor of conventional cast iron. Early 12A engines also feature a thermal reactor, similar to the 0866 10A, and some use an exhaust port insert to reduce exhaust noise. A lean-burn version was introduced in 1979 (in Japan) and 1980 (in America) which substituted a more-conventional catalytic converter for this "afterburner". A major modification of the 12A architecture was the 6PI which featured variable induction ports. The ultimate 12A engine was the turbocharged and fuel injected engine used in the Japan-spec HB series Cosmo, Luce, and SA series RX-7. In 1982 a 12A turbo powered Cosmo coupe was officially the fastest production car in Japan . It featured "semi-direct injection" into both rotors at once, a technique that was much more successful than it would appear. A passive knock sensor was used to eliminate knocking, and later models featured a specially-designed "Impact Turbo" which was tweaked for the unique exhaust signature of the Wankel engine for a 5 horsepower increase. The engine continued until 1989 in the HB Cosmo series but by that stage it had grown a reputation as a thirsty engine. Output of the Impact Turbo version was 165 hp (123 kW) at 6000 rpm and 231 Nm (170 ft·lbf) at 4000 rpm. The 12B was a short lived engine that was produced for the Mazda RX-2, and the RX-3. It had increased reliability from previous series, and it introduced a single distributor. This was the beginning of the single distributor rotary engines, before that, the 12A and 10A were both twin distributors wankels.The improved 12B was quietly introduced in 1974. The 13B is the most widely produced engine. It was the basis for all future Mazda Wankel engines, and was produced for over 30 years. The 13B has no relation to the 13A. Instead, it is a lengthened version of the 12A, having 80 mm (3.1 in) thick rotors. Each rotor had a displacement of 654 cc, for a total of 1308 cc displacement in the engine. In the United States, the 13B was available from 1974 through 1978 and was then retired until the 1984 RX-7 GSL-SE. It disappeared from the US market again in 1995, when the last US-spec RX-7s were sold. The engine was continually used in Japan from 1972's Mazda Luce/RX-4 through 2002's RX-7. The 13B was designed with both high performance and low emissions in mind . Early vehicles using this engine used the AP name. 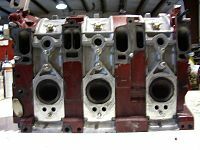 A tuned intake manifold was used in a Wankel engine for the first time with the 13B-RESI. RESI = Rotary Engine Super Injection. The so-called Dynamic Effect Intake featured a two-level intake box which derived a supercharger-like effect from the Helmholtz resonance of the opening and closing intake ports. The RESI engine also featured Bosch L-Jetronic fuel injection. Output was much improved at 135 hp (101 kW) and 180 N·m (133 ft·lbf). Like the 12A-SIP, the second-generation RX-7 bowed with a variable-intake system. Dubbed DEI, the engine features both the 6PI and DEI systems, as well as four-injector electronic fuel injection. Total output is up to 146 hp (109 kW) at 6500 rpm and 187 N·m (138 ft·lbf) at 3500 rpm. The 13B-DEI was turbocharged in 1987. It features the newer four-injector fuel injection of the 6PI engine, but lacks that engine's eponymous variable intake system. The twin-scroll turbocharger is fed with a two-stage valve to reduce turbo lag. Output is rated at 185 hp (138 kW) at 6500 rpm and 248 N·m (183 ft·lbf) at 3500 rpm. The 13B-REW was first series production twin sequential turbo systems to be offered for sale. Often mis-represented as a 13B-RE due to this symbol being cast into its upper manifold. The 13B-REW from the JC Cosmo series was endowed with the largest side ports of any later model rotary engine. Compared to the twin turbo's fitted to the 13B-REW on the FD RX-7, these sequential turbo's received a large (HT-15) primary with a smaller (HT-10) secondary turbo. Injector sizes = 550cc PRI + SEC. Approximately 5000 13B-REW optioned JC Cosmo's where sold making this engine almost as hard to source as its rarer 20B-REW big-brother. .
A twin-turbocharged version of the 13B, the 13B-REW, became famous for its high output and low weight . The twin Hitachi HT-12 turbos were operated sequentially, with the primary providing boost until 4,500 rpm, and the secondary coming online afterwards. Output eventually reached, and may have exceeded, Japan's unofficial maximum of 280 DIN hp (206 kW) for the final revision used in the series 8 Mazda RX-7. In Le Mans racing, the first three-rotor engine used in the 757 was named the 13G. The main difference between the 13G and 20B is that the 13G uses a factory peripheral intake port (used for racing) and the 20B (Three Rotor Engine) uses side intake ports. It was renamed 20B after Mazda's naming convention for the 767 in November 1987. The three-rotor 20B-REW was only used in the 1990-1995 Eunos Cosmo. It was the world's first volume production twin-turbo setup featured in both 13B-REW & 20B-REW form. It displaced 1962 cc (three 654 cc rotors) and used of turbo pressure to produce and . The first Mazda racing four-rotor engine was the 13J-M used in the 1988 and 1989 (13J-MM with two step induction pipe) 767 Le Mans Group C racers. This motor was poorly designed, and was replaced by the 26B. 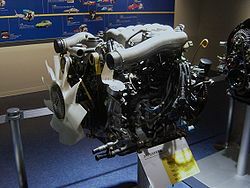 The most prominent 4-rotor engine from Mazda was used exclusively for various Mazda-built GT cars (including the 767 and 787B) in replacement of the older 13J. In 1991 this engine in a 787B became the first from outside the U.S. or Western Europe and the first (and so far only) car with anything other than a reciprocating engine to win the 24 hours of Le Mans race outright. It displaced 2622 cc and developed 700 hp (522 kW) at 9000 rpm. The engine design originates as a single 13B with: an additional rotor and housing added at each end, continually variable geometry intakes, and an additional (third) spark plug per rotor. The R26B's rotor housing can be purchased at retail from Mazdaspeed, but no internal parts are available to the general public . The Renesis engine – also 13B-MSP, for Multi Side Port –, which first appeared in production in the 2004 Mazda RX-8, is an evolution of the previous 13B. It was designed to reduce exhaust emission and improve fuel economy, which were two of the most recurrent drawbacks of rotary engines. Unlike its predecessors from the 13B range, it is naturally aspirated, leading to lower power from its two versions (Mazda RX-7's twin-turbocharged 13B-REW (280 hp). The engine entailed two major changes. First, the exhausts ports are no longer peripheral but are located on the side of the housing, which allowed engineers to eliminate overlap and redesign the intake port area. This produced noticeably more power, thanks to a better compression ratio. Second, the rotors are shaped differently, especially their side seals and low-height apex seals, which offer optimized lubrication. All the Mazda rotary engines have been praised for their "light weight" but they are quite heavy for their size. The unmodified 2005 13B-MSP Renesis has a curb weight of 122kg without engine fluids (such as coolant, oil, etc), transmission (automatic transmission weighs more than manual gearbox), carbon-fiber-composite drive-shaft, differential weight, or any aftermarket components . These and other innovative technologies allow the Renesis to achieve 49% higher output and dramatically reduced fuel consumption and emissions (the RX-8 meets LEV-II). It won International Engine of the Year and Best New Engine awards 2003 and also holds the "2.5 to 3 liter" size award for 2003 and 2004, where it is considered a 2.60 L engine. Finally, it was on the Ward's 10 Best Engines list for 2004 and 2005. The Renesis has also been adapted for a dual-fuel use, allowing it to run either on gasoline or hydrogen. Also known as the Renesis(2), made its first (and so far only) appearance in the Mazda Taiki concept car. In developing the next-generation Renesis, Mazda made a thoroughgoing revision of engine dimensions including the trochoid rotor housing, adopting a longer stroke and larger displacement of 1600cc (800cc x 2) aimed to raise thermal efficiency and boost torque at all engine speeds. By employing the Hydrogen RE design policy of a direct injection system and aluminum side housing, as well as various other measures, we are further promoting the rotary engine’s merits of light weight and compact size. Mazda was fully committed to the Wankel engine just as the energy crisis of the 1970s struck. The company had all but eliminated piston engines from its products in 1974, a decision that nearly led to the company's collapse. A switch to a three-prong approach (piston-gasoline, piston-Diesel, and Wankel) for the 1980s relegated the Wankel to sports car use (in the RX-7 and Cosmo), severely limiting production volume. But the company has continued production continually since the mid-1960s, and is the only maker of Wankel-powered cars (the RX-8) today. Though not reflected in the graph at right, the RX-8 is a higher-volume car than its predecessors (Apr-Dec 2003 60100 RX8 are produced), and Mazda is considering adding more Wankel models . The company has also developed a hydrogen-powered version of the Renesis. Though sales leveled off in the 1990s, these factors could cause the Wankel to again be a substantial force in theautomotive market .